Hallux Limitus (also called Hallux Rigidus) is a stiffness in the joint of the big toe that can cause pain and callus on the bottom of the big toe. The cause of this condition is abnormal alignment in the long bone found behind the joint of the big toe. This longer bone causes elevation of the big toe above the other toes on your foot. When walking, running, or even standing, the joint jams and the big toe cannot move smoothly. Over time, this can even lead to degenerative arthritis of the big toe. This condition can be improved or worsened by a number of things, including the shoes that you wear. Read on to learn about some of the best shoes for women. There are a few factors that make the Women’s WW92 by New Balance the best walking shoe. First, the shoes come with a thick, rigid sole that prevents excess movement and the ROLLBAR positioning system that controls motion. These are important because they minimize movement (and discomfort) of the big toe. Another benefit is the incredible shock absorption that results from a unique non-cellular elastomer called ABZORB SBS that reduces the impact that your toe (and the rest of your foot) feels during walking. Finally, the shoe is roomy enough that you can add customized orthotics if you need to. There is one downside to this otherwise great shoe and that is that the tread is a little slippery. This shoe may not fare well on slippery surfaces if you are not careful. Verdict: These shoes only have a slight drawback of not being slip-resistant on all surfaces. Otherwise, they are extremely comfortable and provide the needed support. Like the previous shoes, the W890v4 also feature ABZORB cushioning that helps protect your big toe from the impact. However, they also feature extra padding on the collar and tongue for additional support and comfort. Another feature that makes these shoes great for someone with Hallux Rigidus is the extra room in the toe area that keeps your big toe from cramming against the outside or top of the shoe. Finally, they are extremely lightweight and comfortable to wear. The disadvantages of this shoe start with the minimal arch support. While some people may find that this is beneficial for their foot, others may find the lack of arch support uncomfortable. The other disadvantage is that the sizes this shoe comes in are all over the place. You should either buy them from a store where you can try the shoes on before you buy them or make sure you purchase from an online shop like Amazon with a sturdy return policy and order a ½ size to a full size larger. Verdict: If you have an opportunity to try these shoes on first, you may find that they work well. Since the arch support you need depends on your individual foot, be sure that you can wear a shoe with minimal arch support before purchasing. If so, then the comfort factors of this shoe make it a great option. The first feature of this shoe that makes it a great choice is the large toe box, which leaves plenty of room for your big toe. It also comes with good ankle support that stabilizes your foot and extra cushioning in some of the areas that have a heavier impact when walking. Finally, the high arch offers great support. There are two areas where this shoe may or may not be a good choice. First, there is a wider heel area than you would expect on most shoes. Second, the design of the shoe causes most people to shift more of their weight to the ball of their foot. Each of these may or may not be an issue, depending on your individual preferences. Verdict: This is a shoe that will work incredibly well if you have the right size foot and you can handle a little bit of weight on the ball of your foot. The stabilization, cushioning, and arch support that this shoe offers makes it a great shoe choice for someone suffering from Hallux Rigidus. These shoes are perfect for women with Hallux Rigidus for many reasons. The large toe box is roomy which is important when you suffer from this condition while the extra cushioning in the forefoot helps with problem areas. Another benefit is the specific fit and support of the shoe, which keeps your entire foot stabilized to prevent toe jams. Finally, the good arch support does not put too much weight on the front of your foot. As an added benefit, the shoes come with removable insoles. You can leave them in for additional comfort or remove them and put your own customized orthotics in the shoe. One downside is that the soles of the shoe are rather stiff. Depending on your preference and the specifics of your condition, you may not like this feature. Verdict: If you can get over the stiff sole, this shoe is an excellent choice. The shoe easily stabilizes your foot and it is also very comfortable for most wearers. One of the major benefits of these dress shoes is that the insole conforms to your foot after the first wear, which helps prevent slippage and stabilizes your foot. It also features a wider toe box than most dress shoes and a thick, rubber sole that grips well on nearly any surface. The shoe is not always comfortable at first, but it does wear in. There are two downsides to this shoe. First, it is not a deep shoe. This means that if you have certain deformities in your foot or your big toe joint sticks up, your toe may rub against the shoe and cause you pain. Additionally, some people find that the shoe puts too much pressure on the ball of the foot and exacerbates pain. Verdict: As a dress shoe, Alegria Professional Slip-Ons are fairly comfortable. They offer plenty of room in the toe box and are quite stable for a dress shoe. However, these may not be the best choice for a day-to-day shoe because of the pressure exerted on the ball of the foot. Some people also may find that the shoe is not deep enough. 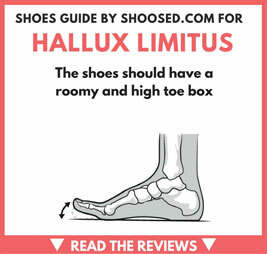 The unique design of these shoes makes them an excellent choice for Hallux Rigidus. First, there is a rubber toe bumper around the front side of the shoe that protects your toes, which is important enough when you suffer from this condition. In addition to the toe bumper, the shoes feature a bungee lacing system that holds the foot sturdy and eliminates shifting of your toes and foot inside the sandal. This stabilization is important. You will appreciate this sandal as a summer shoe. Despite its support, the fabric is lightweight and breathable. It also offers excellent arch support and a thick rubber sole that provides stable and comfortable cushioning. There are two small disadvantages. First, the color of the material that makes up the toe bumper sometimes wears off. Second, the area where you put your foot into the shoe has a rather small opening. If you suffer from this condition, you may have to touch sensitive areas of your foot to put your shoe on. Verdict: If you can get your foot into this sandal without hurting it too much, this sandal is a good choice. It offers the stabilization and comfort that you would expect from a larger shoe without being too heavy. So, what is the final verdict? The best shoes are New Balance Women’s WW928 walking shoes. This shoe earned its spot as number one for a few reasons. First, the shock absorption minimizes painful impact. The design also reduces the level of impact as you walk, which is important for someone suffering from Hallux Rigidus. These benefits, paired with the thick sole and cushioning make this one of the most comfortable shoes for this condition. The thread may be a little slippery, but you may decide to overlook that once you feel how incredible they feel on your feet. Hello, my name is Joanna. I am a blogger living in California. This is my blog, where I and my friends post tips about the fashion world and fitness. I hope you will enjoy the articles.